Fishers Island is at the top left of the chart where the blue water lies off Connecticut. That's Block Island to the right, and Montauk at the center. 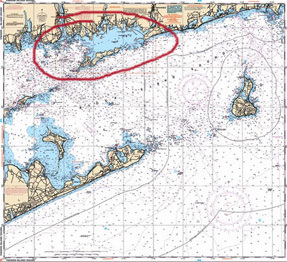 Fishers Island is located at 41°15'43" North, 72°0'26" West. The Island lies just off the mainland of Connecticut and Rhode Island, about six miles north of Montauk across Block Island Sound from Long Island and Block Island. It belongs to the state of New York . It forms the gateways to the Connecticut shore and Long Island Sound. Fishers is an amazing place unlike any other. If you’re looking for an exciting destination with entertainment, this is not the place to be a tourist. If you are looking for a quiet anchorage for the night and some lovely beaches, perhaps to have a bonfire on (you’ll need a permit), this is the place to visit. It has beauty, elegance and class but, if you know no one there or have no reason of going to the island, don't expect lots of friendly services, shops, and restaurants, because they don't exist. All in all, you will enjoy it if you just keep to yourself. Much of Fishers Island is private and so off limits. The entire eastern end - two-thirds of the island - is gated and contains some really spectacular estates visible from the water. About seven miles long and one and a half miles wide, it contains about 4000 acres. There are no traffic lights, limited services, and few cars. There is a private yacht club, a private golf club, a private air field, a small "village", a supermarket, and lots of beaches. In the village, which is about a half mile from the yacht club dinghy docks, the Pequot Inn - the only bar and restaurant on the Island - offers rooms overlooking the harbor and lite fare (pizza, sandwiches, burgers) for lunch and dinner, with billiards and entertainment after 10:30 on weekends. The town is also home to a museum, cafe, (occasional) movie theater (not on Saturday night), ice cream parlor, and bike rental shop. The beaches on the Atlantic side of the Western end extend out to Race Point. The western half of the island offers some interesting biking and walking destinations. The beaches are beautiful. They are on the Atlantic Ocean just at the mouth of Long Island Sound, so there can be substantial surf. Two of the beaches are on the east end and accessible only to residents with stickers. The beach on the West side of the island extends for a couple of miles to the western tip known as Race Point, famous for fishing, tidal rips, and sunset with its picturesque lighthouse. Beach goers on the island seem to know how to conduct themselves in the absence of life guards or signs telling one what not to do. If you need calmer water for small children, there is a small beach in West Harbour which does have a lifeguard (often) and a roped off swim area. While the kids swim, you can enjoy the sailboats on moorings and the scenery. The water is clear enough for snorkeling. The other half of the island is very “real”; small cottages by the sea, fishermen and oyster farmers, a small school and library. Yet, it is unreal that such a life is still possible within a stone’s throw of some of the most populated areas of the country. Its population today is lower than it’s been for much of its recent past, but the islanders have instituted a concerted effort to retain and attract year-round residents. Fishers Island Sound is an interesting body of water to navigate. 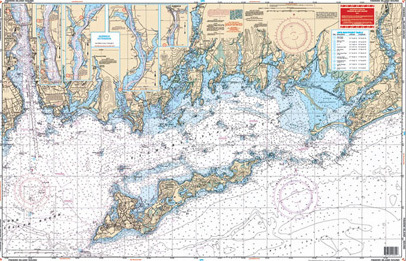 Fishers Island Sound has plenty of challenging territory to navigate. Coming in from the southwest, you’ll have to pass through The Race, with its tide rips over depths of 200-300 feet. From the Northwest, you’ll have to keep an eye out for Seaflower Reef before passing inside the Dumplings. From the East, you’ll need to pick one of the passages through the reefs and islets that extend out to Watch Hill Point, each of which can have tricky currents and boiling tidal rips and eddies. It can be quite “interesting” to watch the water boiling all around you as you pick your way carefully through. East Harbor is quite exposed with reputedly much foul ground. If you do go in with a shallow draft vessel, you'll be surrounded by a golf course. West Harbor is the main harbor and better option. Once inside Fishers Island Sound, you need to pick one of three approaches through the final barrier to this deep water harbor  your best approaches from this direction are either the narrow passage between C”1W” and N “2W” where you’ll find 11 feet of water or the passage between Pulpit Rock and Flat Hammock which gives you 10 feet MLW and a straight shot into the harbor. Once inside the harbor, you'll find 7 to 17 feet of water MLW and the holding is pretty good. The waters are well protected except directly from the North. The ferry comes in here. There is a dinghy landing and a fuel pump at the Fishers Island Yacht Club and Marina with extremely limited hours. The yacht club opens its dock (but not the clubhouse) to transient boaters, and it can even accomodate megayachts. Pirate's Cove Marine, in the almost fully enclosed hurricane-hole of an inner harbor, maintains some moorings in the outer harbor and monitors channel 9. They also have a dinghy dock but their location is a bit far from the "village". There is a possibility of provisioning at the supermarket, once again with extremely limited hours and a fair hike there and back from the harbor. Fishers Island is home to submerged aquatic vegetation beds. The ecological significance of these beds has caused these sites to be identified for potential inclusion in the LIS Stewarship Initiative. The beds are exemplary submerged aquatic vegetation and rocky reef habitats and contain 98% of the eelgrass meadows in NY waters of LIS which are critical habitat for bay scallops, among other species. It has been designated as New York State Significant Coastal Fish and Wildlife Habitat. In other words, it is quite pristine and beautiful. Fishing in the harbor is reportedly very good and Pirate's Cove has a small ship's store with bait and tackle. The dockmaster at the yacht club can organize fresh lobsters to be delivered there if you are so inclined. Meanwhile, Fishers Island is also home to the areas premiere oyster hatchery and farm, from where oysters are delivered to the finest restaurants in the NE. You can order these fresh succulent beasts direct and then perhaps even try some unusual recipes at home. Fishers Island has had an interesting history. The Pequot Indians called Fishers Island "Munnawtawkit" but in 1614, Dutch explorer Adrian Block discovered the island and named it Vissher's Island . The General Court of Massachusetts granted Fishers Island to John Winthrop, Jr. on October 7, 1640 . Winthrop lived only one winter on the island. After being named Governor of Connecticut he used the island as a place to raise horses and goats. Fitz John and Wait Still Winthrop inherited the Island from their father and it stayed in private hands until the twentieth century. 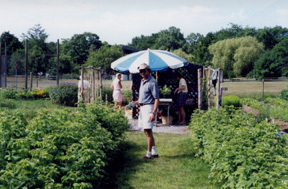 The Winthrop family farmed the island for 218 years until Robert R. Fox bought it in 1863. In 1889 the island was sold to Edmund and Walton Ferguson. Although Fishers Island has gradually been developed it remains a very private place. It has been part of Southold Town since 1879 when a joint commission from Connecticut and New York decided the latter had legal title. Wind-driven tidal surge sweeping over Money Pond at the height of the Great Hurricane of 1938 sliced Fishers Island in two. The breach turned Fishers Island's easternmost tip into a temporary "island" that encompassed only the McDonell residence (today Luce, founder of Time, Inc.) and the Simmons' "castle" (today Hanley). There are quite a few fantastic estates and famous residents who guard their privacy fiercely. Click here for a list of services and things to do on the island.